SEA CEPTOR is the second major package of work launched under the Portfolio Management Agreement (PMA) signed between MBDA and the UK MoD in March 2010. Under this Agreement, MBDA has responsibility to lead the transformation of the UK’s Complex Weapons (CW) capability through the management of a portfolio of projects potentially worth up to £4 billion over 10 years. SEA CEPTOR employs the core principles of the PMA and is a major contributor to the financial benefits of the portfolio approach, delivering some £1Billion of efficiencies for the UK MOD. Peter Luff - Minister for Defence Equipment, Support and Technology - will visit MBDA staff at Filton today (Monday) to discuss the contract. He said: “The development of this missile system is a huge boost to the UK’s world-leading missile industry and once again proves our commitment to providing battle winning technology to our Armed Forces. The introduction of this cutting edge missile system will not only ensure that the Royal Navy will be able to continue protecting our interests wherever they may be, but is also highly significant in sustaining and developing the UK’s skill in building complex weapons. Welcoming the announcement, Executive Group Director Technical and UK Managing Director Steve Wadey said: “This contract is important for a number of reasons. In the first instance it ensures that with SEA CEPTOR the Royal Navy will have the best equipment to protect its ships and crews against the growing threat. The contract is also a powerful example of how industry and the MoD can deliver together an advanced capability that meets military needs in the most cost-effective manner. It is also a highly significant step in advancing and sustaining the UK’s mastery of complex weapons technology. Importantly, SEA CEPTOR, ideally suited to the Type 26 Global Combat Ship as well as a wide range of other vessels, is highly relevant to a number of navies around the world who are looking for a next generation naval air defence system capable of countering the growing future anti-ship threat”. SEA CEPTOR will protect both the host ship and high value units in the local area with its capability to intercept and thereby neutralise the full range of current and future threats including combat aircraft and the new generation of supersonic anti-ship missiles. Capable of multiple channels of fire, the system will also counter saturating attacks. Significantly, with SEA CEPTOR this enhanced level of naval air defence will be provided at lower in-service costs for the remaining life of the Type 23s. It will enter service in the middle of the current decade after which it is planned that it will equip the Royal Navy’s Type 26 Global Combat Ship as that replaces the Type 23 after 2020. A key design driver behind SEA CEPTOR’s concept lies in its simple integration philosophy. The system has been designed with the Global Combat Ship specifically in mind, however, SEA CEPTOR can be easily retrofitted into a wide range of platforms, ranging from 50m OPVs to large surface vessels. The fact that the system will so easily replace the Type 23’s existing air defence weapon is evidence of its modular flexibility. Two main features provide this flexibility. SEA CEPTOR is a “soft-launch” weapon which allows for a very compact launch system that can be easily positioned in a number of below and above deck locations. More significantly, as a highly accurate and responsive system with missiles featuring precision guidance, SEA CEPTOR interfaces with the ship’s existing surveillance radar and therefore does not require the dedicated fire control radars on which semi-active systems depend. FLAADS is the name of the far-reaching MoD programme aimed at delivering a new air defence system not only for the Royal Navy but also for the British Army to replace its Rapier deployable air defence system. 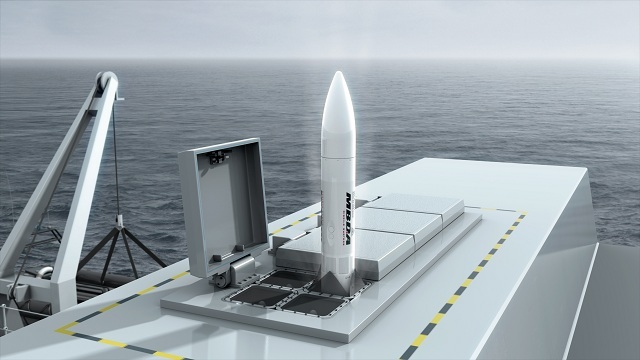 At the heart of both systems (SEA CEPTOR for the Royal Navy and the future CEPTOR-based land system for the British Army) is MBDA’s Common Anti-air Modular Missile (CAMM).